"Invalid Code Signing Entitlements. The entitlements in your app bundle signature do not match the ones that are contained in the provisioning profile. According to the provisioning profile, the bundle contains a key value that is not allowed: '[XXXX.com.sample.company ]' for the key 'keychain-access-groups". 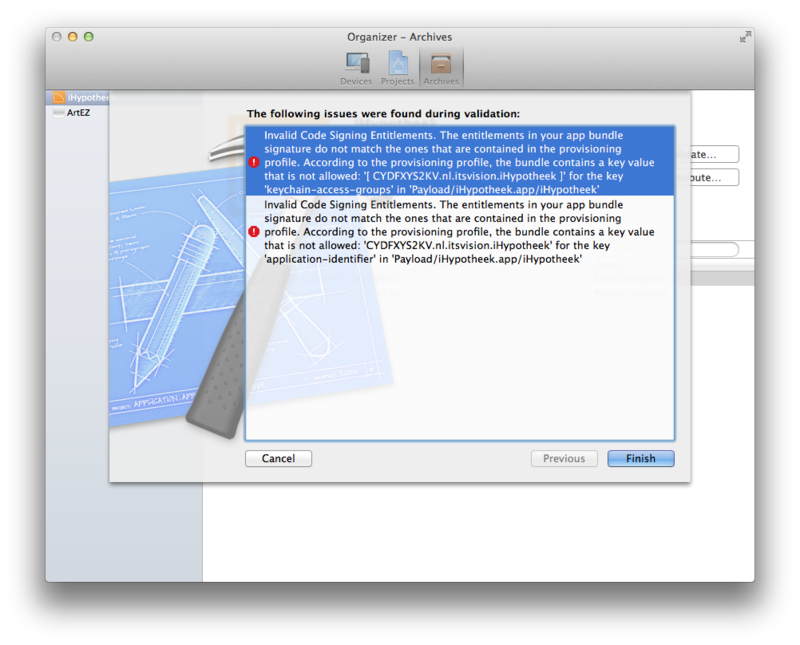 Also the same error for a key value called application-identifier. 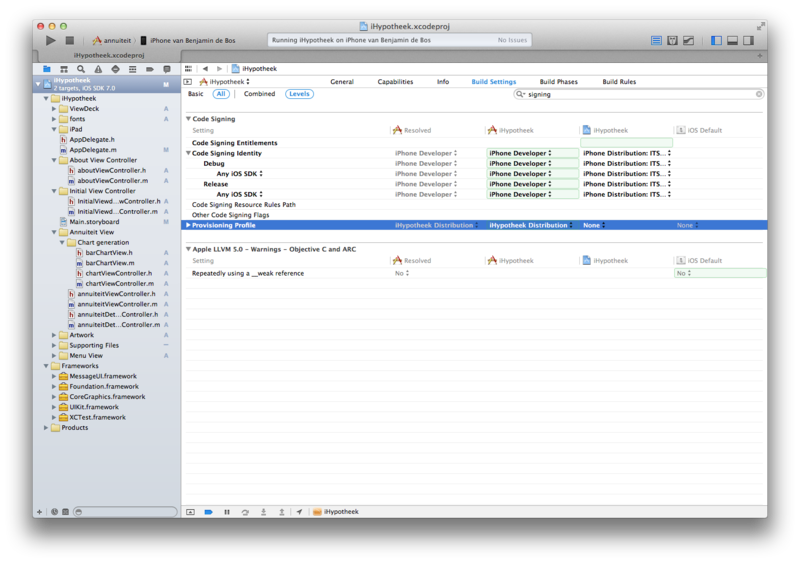 The solution lies in the new option in Xcode 5 which says provisioning profile. Just set the project target's provisioning profile to the right one and it'll work. If you are like me and you think you tried EVERYTHING, archived your project over ten times, banged your head on the keyboard and still get this error. Please do yourself a favor and simply Restart XCode, it worked for me. Sometime Apple... I hate you. In another case I needed to switch this identity from "None" to the developer account managing the identities and profiles. Xcode sometimes messes up greatly with code signing, it seems. Or, we mere mortals simply aren't clever enough to understand what it is doing, of course. Don't give up, we're all going through some code signing torture at times! In my case, I had to set correct Provision Profile for Release, and then had to restart Xcode. Before restarting, it had same provision profile, and didn't work. So, sometimes a restart can do miracles. Maybe this helps somebody. If someone uses a GameCenter then check this section in your target. I worked with some old project and there were 2 errors (but everything worked fine). 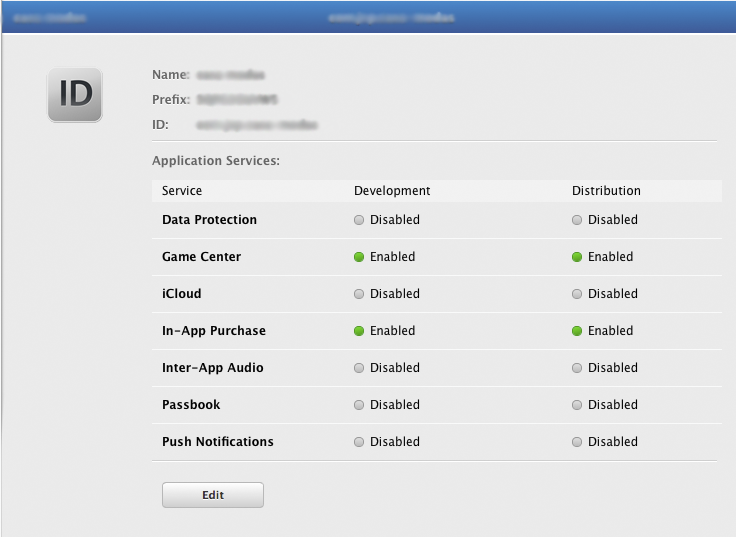 Disabling and enabling it back solved this problem. Most likely this action adds Game Center entitlement to App ID and and handle it itself. 4. Make sure you assign a valid Provisioning Profile to your app before validating - double check your provisioning profile for your app in the Apple Member Center, make sure it isn't expired, has the right App ID with the correct bundle id and distribution. Download and click on the new provisioning profile to make sure XCode has it, or go to XCode > Preferences > Accounts > click on your account and 'View Details' then click the bottom corner button to Sync all the profiles to XCode. You should have the profile available to select now in the 'Code Signing' section. Once you have the correct provisioning profile then you can set the 'Code Signing Identity' lines to the correct option for that provisioning profile. In the Utilities pane (to the right) in Xcode 5, under project Document, change from Xcode 3.1-compatible to Xcode 3.2 compatible. Remove the two Distribution clauses (isa=XCBuildConfiguration). Now you're ready to re-open, archive and submit to App store - voilà! It works again! I assume this works because Apple somewhere along the line decided to drop the need for any separate distribution config, which is a good thing. When I archive, Xcode automatically code signs for distribution. That's the way it should have been implemented in the first place, it's just a shame that Apple can't make auto-migration part of the IDE; instead they force us developers to spend man-decades to make this stuff work. But, I finally managed to solve the problem! The problem I had was with an old app that I haven't touched in over 3 years, and now I was about to release a long awaited update. Since the time I released the app, Apple has been updating how the certificates and App Id works. They have introduced the concept of Team Id which seems to be recommended to use. In particular, the Apple's "Certificates, Identifiers & Profiles" site, has seen a lot of changes since then. There I realized that the Provisioning Profile I was using for App Store Distribution were connected to the App Id ED8xxxxxxx.com.rostsolutions. * but looking at the App Id for the game I was about to submit I notice that the App Id was ATMxxxxxxx.com.rostsolutions.Swisch. So the App Id prefix did not match! That seemed to be the root of the problem. So what I did was to create a new Provisioning Profile connected to the App Id ATMxxxxxxx.com.rostsolutions.Swisch instead. Using that Provisioning Profile I successfully submitted my app to App Store and now I just keep my fingers crossed that everything else works fine at Apple's side. (I first tried to connect to new Provisioning profile to the wildcard Id ATMxxxxxxx.com.rostsolutions. * instead, but that didn't seem to work). But what puzzles me is that when I look at the old App in iTunes Connects and goes to Binary Details, it says that the App Id is ED8xxxxxxx.com.rostsolutions.Swisch. So why is the "Certificates, Identifiers & Profiles" page listing the App Id as ATMxxxxxxx.com.rostsolutions.Swisch? My problem was solved by removing my Apple ID from Preferences->Accounts and then adding it back again. Then all my provisioning profile files showed up on the View Details utility panel. I was mistakenly choosing "Mac Team Provisioning Profile:*" instead of the actual distribution provisioning profile for the project thinking that it was a generic selection. Provisioning files must be specific to the project. Oh, and BTW, make sure your provisioning profile has the correct entitlements (for example, Maps). I managed to release an app with OSX Maps without the entitlement and Apple approved it -- but no Maps showed up on the production version! In my case, I had the same problem, my solution was to change the 'Release Provisioning Profile' in the Build Settings before doing Archive. I do this twice, once for App Store distribution, and another one for Ad Hoc distribution. I also add a comment on my archives. My conclusion is that there is something broken about the "archive re-signature". There is a very good tutorial for solving that problem on this website. It says that this problem can occur when your Projects Bundle Identifier is different to the one you entered on the iTunes Connect Website. I think xcode 5 uses "release" instead of "distribution" that you may created yourself. If all above didn't work (in my case after couple of days no luck trying everything) I have only one Mac application. BE CAREFULL WITH REVOKE! 1) Revoke by hand all "Mac App Distribution" & "Mac Installer Distribution"
7) Provisioning Profiles -> Distribution -> create/fix custom provision for AppStore (I'm specially named it as "Mac provision profile for AppStore"
I have been struggling with similar problem (I was building for Ad-Hoc distribution). Only thing that has changed since last successful deploy, was adding two devices to provisioning profile. After double- and triple- checking all build settings, I regenerated provisioning profile (without changing anything), re-downloaded and it worked fine. So note to self: if there is no logic explanation, you can always try good old IT voodoo. I also recommend iPhone Configuration Utility, which despite its name, is useful for checking what provisioning profiles you have on computer. ERROR ITMS-9000: “This bundle is invalid. New apps and app updates submitted to the App Store must be built with public (GM) versions of XCode 5.1.1 or higher and iOS 7 SDK. Do not submit apps built with beta software. If multiple developers are using the same member center account. One of them can't use a certificate created by others cause they used a certificate request created using their computers. You need to use a certificate created by you (certificate request created using your computer). Alternative, told them to send you the Developer Profile. not sure of the name. to use a certificate created on another computer. 1) In your Project and your Target(s) build settings, choose "None" for all Provisioning profiles, and choose "Don't Code Sign" for all Code Signing Identities. 2) Now, choose your Target and go to build settings. In Code Signing Identity Release setting, choose "iOS Distribution" for "Any iOS SDK". 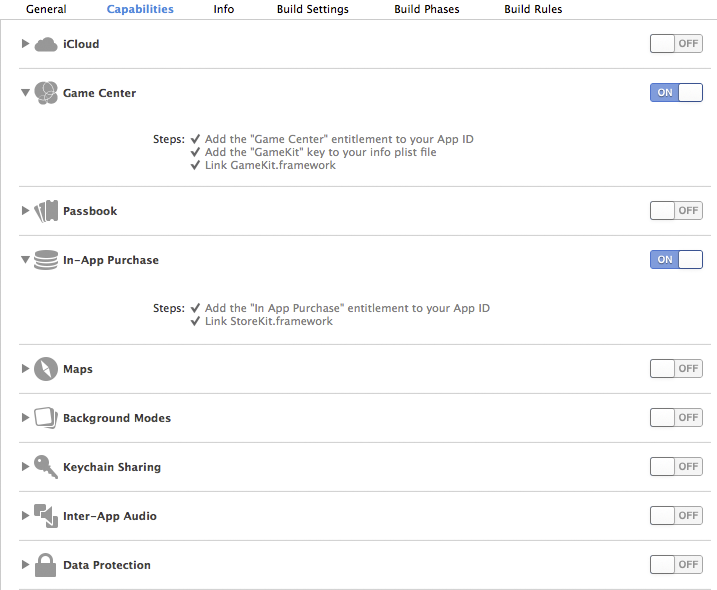 And then, in Provisioning Profile Release setting, choose your distribution profile for "Any iOS SDK". After that your Code Signing Identity Release setting should automatically change to "iPhone Distribution". 3) Archive your build and validate. Now it should work fine. That's it! Not the answer you're looking for? Browse other questions tagged objective-c xcode macos code-signing xcode5 or ask your own question.